Editor’s Note: Jim Casale is a talented writer who has a lot of insights into how to get the most of your money when it comes to actually playing Magic, and we’re excited to welcome him to the MTGPrice team! I’m looking forward to seeing his content here every Tuesday. I’m sure many of the readers of this article consider themselves players of Magic: the Gathering, a collectable card game unlike many others in its longevity and the size of its player base. The biggest barrier to entry for many players, like myself is the cost of buying the cards needed to play. I’m here to explain how to best avoid paying too much for the cards you need to play the game. Unlike many columns on this website, mine is not focused for the people that want to speculate on cards. My goal is to find the best time for players to buy the cards they need to play with. These cards may go up in price or may not but the value that you’re gaining here is by playing with the cards. Many people have noticed the recent soaring price of modern cards. Snapcaster Mage, Blood Moon, Olivia Voldaren, Raging Ravine, Oblivion Stone, and Heritage Druid are just a few of the cards that seem to become unreasonably expensive. But what is the reason for all of this? Is it some black market underground dojo keyboard cagefighter speculators or real demand? Well it’s complicated but it’s most likely artificial demand not caused by buyouts but by players who are worried if they don’t buy now it will only go up. Panic is the real problem here. We need to be confident in our purchases and be able to build towards the deck we want to play in the future. Which brings us to my point, what is the true cost of a deck? How does someone decide to “buy in” to a deck? I have a theory to answer all of that. For many Magic players, cards they already own are a sunk cost. When debating what deck to play they do not associate the cards they already own as “costing” anything to them. Which makes a lot of sense, since you don’t have to go out and buy or trade for those cards. This artificially lowers the cost of a deck. If you already own Deceiver Exarch, Pestermite, Snapcaster Mage, and Cryptic Command then it’s a lot cheaper to play the Splinter Twin deck, even if you don’t own any Splinter Twins. The bottleneck is the card that is stopping people from making a deck and it is generally the most costly card in said deck. 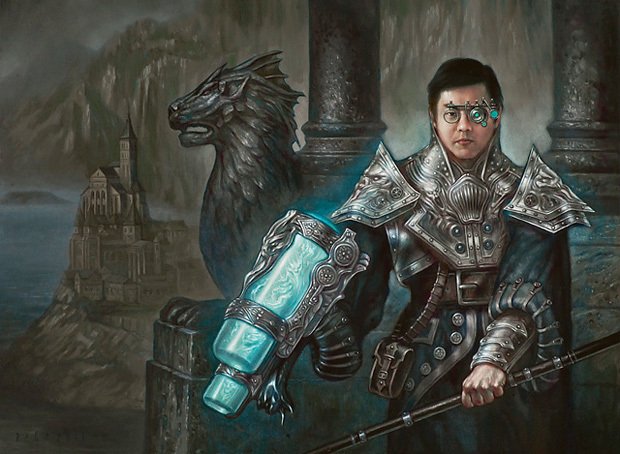 Did you notice what cards got reprinted in Modern Masters 2015? Tarmogoyf, Dark Confidant, Bitterblossom, Vendilion Clique, and friends are all expensive staples that are the bottle neck to building their respective decks. How does someone who wants to build Jund look at the deck? Have you ever heard anyone complain about the price of Terminate as being the reason they are reluctant to build the deck? Absolutely not. They can’t afford the Tarmogoyfs, Liliana of the Veil and Dark Confidants that make up the most expensive parts of the deck. The true cost of the deck is not realized when the barriers are set so high. If a player opens a few of the expensive cards he or she needs to build the deck then true cost of a deck gets lower. This is what is causing the spikes in cards that used to be “cheap.” Snapcaster Mage is the prime example of a card that is bottlenecking anyone from playing a blue deck in Modern. Previous bottlenecks to blue decks have been printed a ton recently and help build more interest in completing decks. The previous bottlenecks to build these style of decks were lands, Vendilion Clique, and Cryptic Command. I would venture to guess that with the abundance of shocklands from RTR block and the flood of fetchlands from KTK block that lands are no longer the biggest barrier to entry to building these decks. Vendilion Clique and Cryptic Command are on their third printing as of MM2015 and you don’t need 4 copies of either card to play the deck. Where does that leave us? Well, at the point we are now. The demand for Snapcaster Mage rises because the true cost of building their deck is lower. If you need 4 Snapcaster Mages to finish your deck completely and they cost $25 then it’s pretty reasonable to spend the $100 and finish it off. If enough people do that then that causes the price of a card to rise. 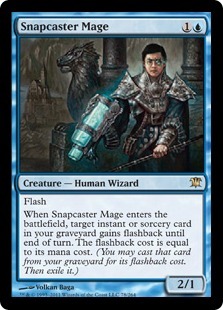 Snapcaster Mage can retail for almost $100 now despite being $30-40 throughout most of last year. Consumer confidence in its statistically-low chance of being reprinted coupled with the lowered true price of the decks, makes this card’s price sky-rocket. What can we do about it now? Not really a whole lot. Maybe Snapcaster Mage will be next year’s GP promo. Maybe we have to wait until MM2016 or MM2017 for a reprint. Either way it looks like in the near future we won’t see a decline. The only reason eternally playable cards decrease in price is because of lowered consumer confidence because of a reprint, the actual reprint, and the card falling out of favor. The key to playing Magic affordably is to plan longer term. The true price of a deck can be very low if you want it to be. Patience and smart purchases can lead to large savings down the road. 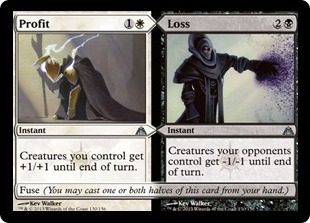 I play Splinter Twin in Modern and have spent maybe $200 on cards for it in the last year. That’s a far cry from the $400 it would take just to buy a set of Snapcaster Mage. The key to this is finding the next bottleneck and purchasing those cards ahead of time. Even right now, I can see a few cards that could bottleneck players in the future. For instance, if you don’t already own your shocklands I can’t recommend buying them any later. The market has been slow to mature due to their low played count in Modern but if we get more juicy land reprints in Battle For Zendikar (like many people suppose we will) then the hardest lands to get will be shocklands. Due to how flooded the market is, I doubt we will see them reprinted again in the near future (next 3-5 years). 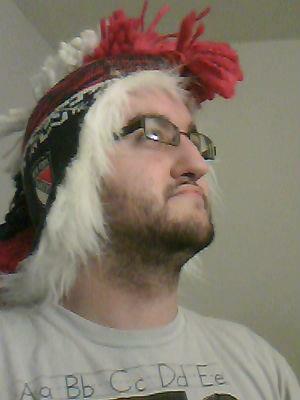 I would also recommend picking up a set of Khans of Tarkir fetch lands. They’ve bottomed out and started to rise and it really doesn’t get cheaper than now. If we don’t get Zendikar fetchlands in Battle For Zendikar then it is likely they fetches rise even faster. The key to finding out when to buy in is important. For Modern this season, the best time to buy cards not in MM2015 was once the spoiler was finished. The time to buy cards in MM2015 was the week before Vegas or on site if you were able to attend. The next thing to consider is the reprintability and reprint schedule for cards. This doesn’t apply to Standard usually, but Modern-legal cards are frequently printed in a cycle. It seems Wizards of the Coast is intent on Modern Masters every two years and it will introduce new copies of existing cards too strong for Standard. When Modern Masters 2015 was announced it was also announced cards from that set would be no newer than New Phyrexia, meaning Innistrad and Return to Ravnica block cards were safe from reprint. That should have been your cue to buy the cards you need from those sets. You can wait as long as possible to see if a reprint is coming, but the backlash for an anticipated reprint not being in the set is fierce. Right now Scalding Tarn and Misty Rainforest’s price is inhibited by the anticipation of a reprint. If there is none, don’t be surprised to see them jump. For Standard players, there is a cycle that ensures you always get your cards for the lowest price. 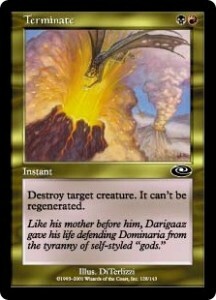 Right now Dragons of Tarkir cards are insanely cheap. Planeswalkers that pre-ordered for $40 or more are now $8-10. With a lot of Standard’s heavily played walkers rotating out soon, it’s never been a better time to get into Tarkir Block cards. If you named the most played planeswalkers in standard you’d probably end up with Elspeth, Ashiok, Xenagos, and Nissa, right? Those all rotate in a few months. The Tarkir block walkers (Sarkhan, Sorin, Ugin, Sarkhan Unbroken, and Narset) are poised to take over. While it’s true some of those cards may not go up in price, it’s pretty likely they will also not go down. Bulk planeswalkers can usually hold a $5-6 value and heavily played ones can skyrocket past $30. I personally did myself a favor and bought a playset of all of the DTK mythics except the Dragonlords and Deathmist Raptor. It’s hard to go wrong there and it will definitely help the true cost of your deck in the future. In the future I hope this column will help you buy into cards at the best possible time and take some of the surprise out of price jumps. As we are quickly approaching the release of Magic Origins, I will be addressing cards that I think you should preorder next week! I have to admit that this is the exact approach I’ve had towards Modern since getting back in to MTG at the end of 2013 after a ~14 year break. Noting what cards are essentials in certain archetypes and more so, which ones are key components of multiple styles is a great way to stay ahead of the game in my opinion. Loved the article though – nice way to relate the theory of anticipation thru observation.